In an open letter to Prime Minister Manmohan Singh, sarpanches of several villages in Bhavnagar district have taken strong exception to the way the Government of India pushing for the proposed 6000 MW Mithi Virdi Nuclear Power Plant. Asking him to refrain from signing any agreement with the US government or other corporations and agencies on the proposed N-plant during his visit to the US, the letter says, "The Government of India has reportedly initiated moves to further dilute the Nuclear Liability Act to seal the nuclear deal with the US government. Intervention of the Cabinet Committee on security is being sought to override nuclear liability for Westinghouse." Saying that this kind of move to give concession to Westinghouse, the company which proposes to give nuclear reactions to the plant, and seal "a nuclear agreement with US corporations during your visit to Washington will undermine all democratic and sovereign institutions of India", the letter says, this is extremely "worrying". Strangely, "the dilution of the Nuclear Liability Act is being touted as a 'gift' to the US government and international nuclear corporations." Registering strong protest, the letter says, "We strongly condemn this brazen contempt for an Act enacted by the sovereign parliament of India. To assure the US government and nuclear industry that the Government of India will make sure that the operator (Nuclear Power Corporation of India Ltd or NPCIL) will not use its ‘right of recourse’ against suppliers of defective equipment is a shameless sell out of Indian peoples’ lives". 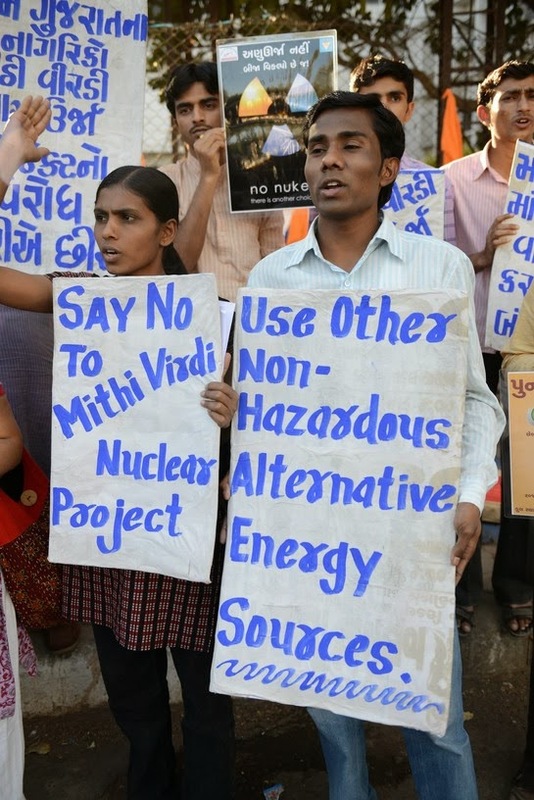 The letter adds, "To offer a liability-less playing field to the international nuclear corporations, whose constant decline has been greatly exacerbated by the setback after the Fukushima catastrophe, actually amounts to selling off Indian people’s lives and safety for nuclear profits. We have not forgotten the criminal record of Union Carbide, now Dow Chemicals, in the Bhopal gas tragedy and the shameless episode of Indian politicians letting the culprits go scottfree: both physically and in terms of adequate liability for the horrendous disaster." Pointing out that the Indian government is "risking citizens' lives even as the crisis in Fukushima has further deepened over last few weeks", the letter says, "While Japan has been forced to switch off all its reactors and countries like Germany, Sweden, Switzerland, Italy, etc. have decided to go nuclear free, it is unfortunate that Indian government is choosing to miss the historic opportunity to go for sustainable, renewable, decentralised and equitable forms of energy and shun nuclear power which contributes less than three per cent of its electricity production". Declaring "strong protest" against any further dilution of the Nuclear Liability Act and endangering the lives of common people of India, the letter says, the 281 "affected people" of Mithi Virdi, Jaspara, Khadarpar, Mandva, Paniyali, Sosiya, Kantala, Chayya, Navagam (nana), Bhankal, Goriyali, Bhavinapara, Kukkad, Lakhanka, Morchand, Odarka, Garibpura, Thalsar, Khadsaliya, Alang, Manar (CT), Bhadbhadiya, Hathab, Gundi, Badi, Alapar, Sanodar, Padva, Vavdi, Sankhadasar, Rajpara, Trapaj, Kathava, Bapada, Sathara, Bharapara, Koliyak, Mathavda, Juna Ratanpar, Kuda, Bhumbhali, Thordi etc. have signed a memorandum and sent it to the PM via the Bhavnagar district collector. Signed as affidavit in Gujarati, each affidavit says that the signatory is a farmer and has inherited agricultural land as the only source of livelihood. "In this area, following a nuclear deal Indian government, the US government and US based Westinghouse Company, the NPCIL proposes to set up a nuclear power plant. I strongly protest the land acquisition of my farm land mentioned above", it says, adding, "I solemnly affirm that I refuse to sell my above mentioned land at any price to the Government of Gujarat, Government of India or NPCIL”. A similar affidavit has been signed by those working labourers in the farms associated with the villages, saying these farmland are their only source of livelihood. The letter has been signed by Shaktisinh Gohil, Sarpanch Jaspara village, Samjuben Dabhi, Sarpanch Mithivirdi village, Vilasba Gohil, Sarpanch Mandva village, Pruthvirajsinh Gohil, Sarpanch Khadarpar village, Bhagwatsinh Gohil, Sarpanch Sonsiya village, Dayalbhai Jambucha, Sarpanch Paniyali village, and Jikuben Dihora, Sarpanch Chayya village. Meanwhile, despite heavy rains, people from the villages affected by the proposed Mithi Virdi nuclear power plant took out a rally from village Jaspara this morning at 9 am. The rally consisted of 69 tractors, tempos and cars and 50 motorcycles and comprising of nearly 2,000 men, women, youths and children. People shouted slogans like “let it go, let it go, let the nuclear power plant go”, “allow us to eat our hard earned rotlo”, “we will give up our lives, not our land”, “let bajra and cotton grow, allow the greenery to flourish”, and “not here, not anywhere; not in any country in the world”. The rally traversed the 40 km stretch to Bhavnagar, meeting the people in the villages falling on the route. The rally was welcomed at Talaja chokdi by the people of Bhavnagar, and terminated at AV School cricket ground, where it turned into a public meeting. A representative group comprising the leaders of the affected villages presented the memorandum to the PM to the district Collector. They were assured that the memorandum would be sent to the PM, and its copy would be sent to the Minister for Environment and the Secretary, Ministry of Environment "at the earliest".